First Line: "Don't ask me to do this." Josie Blair left Dorset Falls, Connecticut, twelve long years ago and never intended to look back. She wanted to make it big in New York City, so she earned a degree and got a job working for a prestigious designer. But the designer turned out to be too temperamental, and when Josie is fired, she finds herself back in Dorset Falls. Those twelve years have not been kind to the town. Going there to take care of her cranky old Uncle Eben, she's also faced with the task of selling the contents of her Aunt Cora's yarn shop. However the meddlesome ladies of the Charity Knitters Association have their own ideas about what should be done. Josie simply cannot understand how on earth Aunt Cora's yarn shop, Miss Marple Knits, has stayed in business so long when almost every single one of the other stores are long gone. But she finds herself becoming attached to the place. 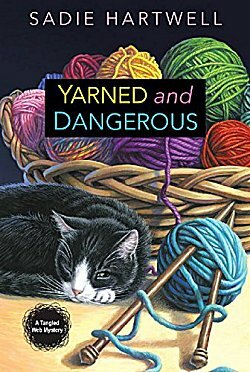 When one of the town's more cantankerous knitters is found dead in a pile of cashmere yarn inside the shop, Josie knows there's something quite wrong going on in little Dorset Falls. The main character, Josie Blair, is the shining star of this book. She's not shy and retiring, so when a Dorset Falls local named Diantha starts slinging barbed remarks in Josie's direction, Josie stands up for herself-- and I loved her retorts to the obnoxious Diantha. Many readers will do as I did and smirk whenever Josie tells a local, "If I could survive New York City...." Those of us outside the Big Apple know surviving in that city can be very different from survival anywhere else, and the Dorset Falls folk didn't fail in my expectations of them. I was enjoying this book so much that it took me a while to realize that the mystery was slow to get off the ground. Was I disappointed? Not at all. In fact, Hartwell's decision made the book much more realistic to me. Josie didn't set out to investigate the death of the woman in the shop because she wasn't invested in the people or the town of Dorset Falls. If you don't feel some sort of real emotional tie to people or to a place, you're not going to lend a hand in solving their problems. I was also impressed that Josie always cooperated with the police, and that those two police officers were sympathetically drawn (if not always sympathetic to Josie). Josie may not know a purl stitch from a pair of circular needles, but I loved the designs she began to create, and her ideas to bring Dorset Falls back to life made me smile and want to pitch in to help. Josie's not the only character in this book to wrap in a hug either. There's her gonna-be love interest Mitch, and the decades-long feud between her Uncle Eben and the farmer-next-door Roy is an absolute hoot. And a word of warning: beware of the women in their sixties who carry bags of knitting around the streets of Dorset Falls. You never know what they're going to be up to! What a great cover! It couldn't be cozier. if there was a contest for cozy covers, this should be entered. I like to read cozies plus crime fiction. Always looking for a good cozy to read. I am going to read this book. That for letting us know about it. If you enjoyed it, I know it is good. Aw-- thanks, Lynn. I hope you enjoy it as much as I did! Should read thanks for letting us know about it. It is funny when I reviewed it, my brain saw what I wanted it to see. When it published, I saw the mistake right away. That's happened to me, too! I love the name of the yarn shop, Cathy! And it's good to hear that Josie isn't a 'clinging vine' or 'dissolve into tears' type. Sounds like the start of a beautiful friendship, so to speak. The name of the yarn shop is a stroke of genius as far as I'm concerned-- and it certainly is what I hope is the beginning of a beautiful friendship! I'll have to look for this. I do like that the author let her character form an attachment to the place before throwing a mystery at her. It always feels unreal to launch a character on a new place and have her instantly involved in a mystery before she's even gotten her feet under her. Yes, I've always found that to be a bit too much myself.